Groove announced April’s releases via their blog earlier this morning. 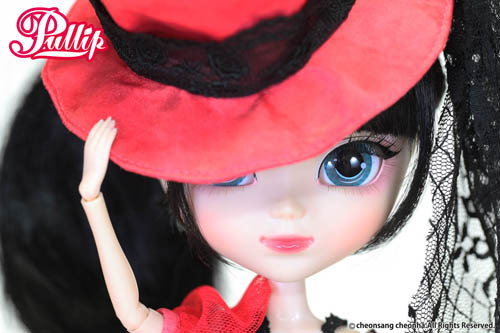 Two Pullips, a Dal and a Pang-ju have been announced so far, none of which are collaborations it’s been a long while since we have seen a month without a single collaboration. The dolls will all be released in April in Japan but they won’t be released in the US until May. 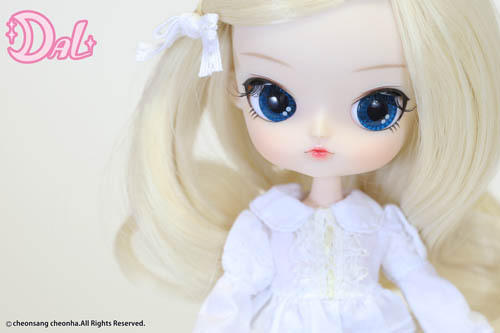 Let’s address the obvious first, Aira is a recolor of Pullip Myra. Myra was a limited edition of 300, this recolor is also limited but to 500. She will come with a LE certificate. Aira has a MSRP of 18000 yen. Aira comes with a second “outfit” really it’s just an alternate set of lingerie and a chair! The same chair came with the original Myra and has since gone on to become one of my favorite props for Pullip photos. This is the best shot of Aira’s face released so far and it’s mostly covered by her hat ^^;. A lot of people didn’t like Myra’s lips because they were painted as very full lips. 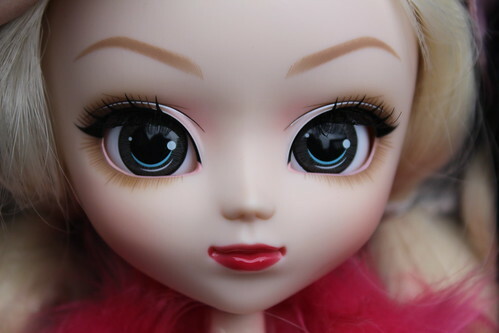 Pullip’s facemold doesn’t change except when Groove changes the body/eyemech then there is a minor variation the most jarring of which was the type 4 facemold as the neckhole is placed much farther forward. Groove is very good at using the face up to make it look like the mold has changed. It looks like the face ups are pretty much the same except for the lips (Myra has fire engine red lips, Aira has pink or light red lips- I can’t really tell) and Aira appears to have some pink shading around her eyes that Myra does not. I think I actually prefer Aira to Myra. Aira’s coloring just seems better coordinated to me anyway. I’m not entirely convinced I need two girls with this showgirl-esque theme but I am quite fond of her and I do see myself snapping her up before she disappears like Myra did. Kore seems to have a mythological theme, she reminds me of Persephone the Greek goddess of spring. 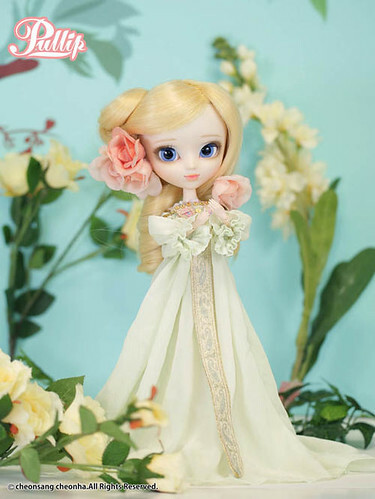 Pullip Blanche who was released previously in 2007 had a similar theme but was no where near as elaborate as Kore. She has a MSRP of 15000 yen, 15000 yen seems to be the new normal for standard (ie. non-collaboration/special) releases. I love, love her face up it’s so sweet and the colors all compliment each other pretty nicely. I especially love her pink lips. Her wig especially with the flowers threaded through it like that is giving me a bit of pause though. Her stock looks nicely detailed, just look at that embroidery. In white clothes soft and fluffy to the tea party Mom and today young lady orthodox, Tsu mon What! The last Dal Creator’s label Heiwa was released in November (December here in the states), Dal used to be released every month so such a long gap between releases was a bit worrying. As soon as I heard a Dal release was going to be released for April, my hope was that it would be the step-sister Dal from the Starry Night Cinderella series as photos have been floating around of her for quite some time now, I think she is the last doll left in the series besides the dwarves that hasn’t been released yet and well I’m really keen on her. I was thoroughly convinced that the step-sister Dal was going to be announced for April, I almost completely forgot that photos of Silane had surfaced at Doll Carnival here (I so hope that the demonic byul next to her gets released some day). Silane has a MSRP of 15000 yen. Silane is a sugary sweet dal dressed all in white, her clothes might just be a bit too angelic for my tastes but they are cute. I actually really do like her face up, it reminds me of some of the more stylized earlier releases versus the bjd-esque face ups Groove seems to be favoring recently. Her face up really draws me to her and makes her go from the can most likely skip category to my wishlist. I much prefer her stock without the frilly headdress. I love her piercing blue eyes. 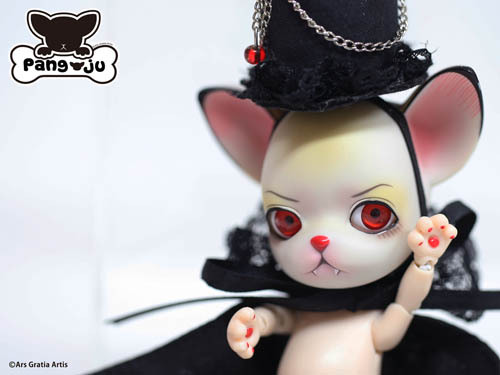 I must say, I did not expect to see a vampiric Pang-ju rounding out the April releases. Black Russian Pang has a MSRP of 10000 yen. 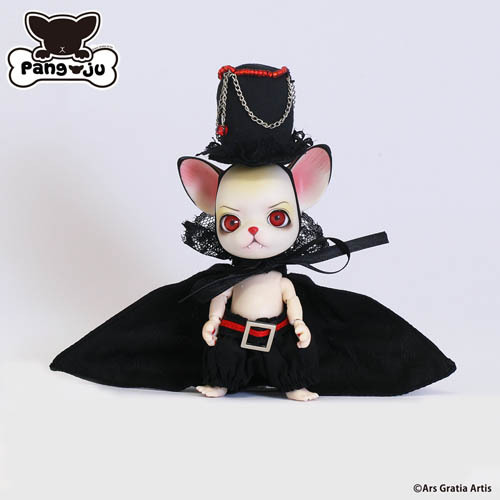 He would be a great familiar for any of the House of the Immortal series of dolls or a great counterpart for the recently released angelic Chiffon cake-pang. I honestly, don’t really get where the Russian thing comes from besides maybe the hat. I actually quite like him, I’m really trying to stick to only having one Pang-ju and I recently purchased Cranberry-Pang but he is so different and unique I think I can justify a second Pang. Just look at those bloody paws d’aww. 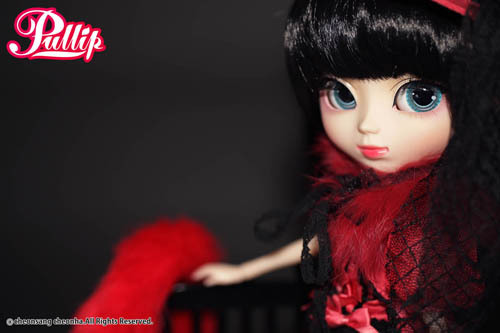 This entry was posted in Dal, Doll, Pullip and tagged aira, Dal, kore, myra, pang-ju, Pullip, silane. Bookmark the permalink. Thank you for these news! 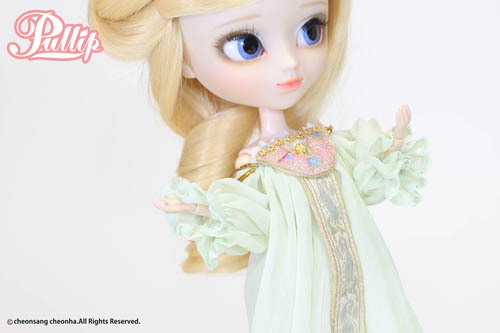 I don’t really care for the showgirl Pullip but OMG I adore the new Dal! I am totally sold on this doll. Her face-up is perfect and I like her dress. The bonnet is not really pretty but that’s just my opinion. I really want Heiwa too so it will be a tough choice between Heiwa and Silane. I am trying to save for a Lati Yellow so I didn’t want to buy another doll until I get it but Dal Silane is making me rethink my resolve. I also like that Silane seems versatile enough for many different cosplay option because her style is not super defined. Sorry for the long comment, I am just so excited about this new Dal release! Making dolly decisions is hard, I think Lati is just about due for another event. I’m probably going to sit it out though as my last two Lati dolls took over eight months to ship, even though I love the dolls the waits are starting to be too much for me. At least Pullips have a pretty reliable release schedule. I am in love with Kore. She is my favorite from this months releases! I am totally getting her when she comes out. Kore is definitely a beautiful release. 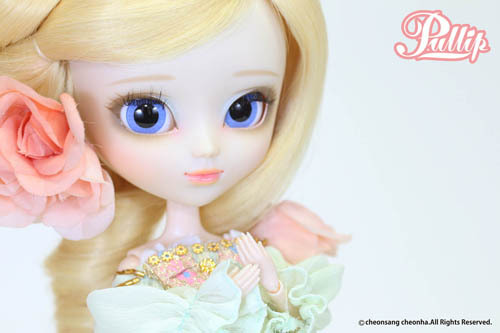 I love Kore’s faceup! Soooo pretty. Kore definitely has a gorgeous face up. I’m looking to see if I can find a split partner to take her outfit as I love her but not it. Great update on the latest releases! i believe Kore of April is based on Alphonse Mucha’s art? It definitely appears so but Groove has not officially said anything so she while she may have been inspired by it isn’t official like the Girl with a Pearl Earring release.